The grey outside the casement windows is soporific. Thunder rolls, crashing in operatic waves, from one end of the sky to the other. Cracks of lightening etch themselves neatly into the rain, striking near. My limbs are heavy, mouth sour. I’ve just awoken from an afternoon nap and can hear the kettle whistle downstairs. He must be brewing maté. I blink and stretch out my limbs, pointing my toes. I’m not, as a general rule, the napping sort. In fact, I usually have a hard time sleeping at all. A thrum of lists, ideas, worries, and plans keeps me awake at all hours often leading me to, in exasperation, get up and write them down. My mind is difficult to quiet, and it seems to be forever tapping its foot. Naps, as such, make me anxious. I have a fluttering rabbit heart. But this afternoon I was exhausted, the kind you feel in your marrow. I spent all morning and early afternoon at the market with a meager three hours of sleep, handing out, along with pie samples & recipe booklets, information on Slow Food’s Chattanooga chapter. Slow Food is an international grassroots organization that was founded to counter fast food, and in essence it’s about reclaiming the way people used to eat: “good, clean, and fair” food that is delicious, communal, and sustainable. What does pie have to do with Slow Food? The pies, made from scratch with local produce, serve as a catalyst to get people excited about the bounty of our region from apples to figs to peaches to peppers, and Slow Food will be having pie baking class on the 25th of August at Crabtree Farms. These tiny pies were a teaser. If you’d like more information, you can visit Slow Food Chattanooga. Yesterday was spent on my feet baking nearly one hundred miniature two inch pies late into the night for the market today. The way I saw it, the later they came out of the oven, the fresher they’d be. And they were. Washed with egg and dusted with sanding sugar, they came out sparkling and brown, perfect little medallions in four summer flavors: figs, balsamic, honey, and rosemary; yellow peach, jalapeño, lime, and mint; apple, cinnamon, thyme, and cheddar; and white peach, honey, rosewater, and basil. I promise to share the recipes for the fillings soon, in the upcoming week or so. But now is time for rest, quiet, and bread. Bread is one of those dangerous things to write about, not unlike love. It’s a proverbial metaphor rife with clichés, and innumerable people have gone on about the smell of fresh baked bread, how good it is for the soul, etc. But for good reason. Bread is an ancient food, seemingly braided into our DNA, and the baking of it is wild magic, like spinning straw to gold. The most basic breads, born of water and grain, are a miracle of biochemistry. The smell of fresh baked bread is a cliché comfort up there with babies’ skin and puppy fur for a reason, and for a girl with a jittery rabbit heart such as myself, baking bread is a meditative panacea for my time travelling mind. It plants my feet. Slows me down. 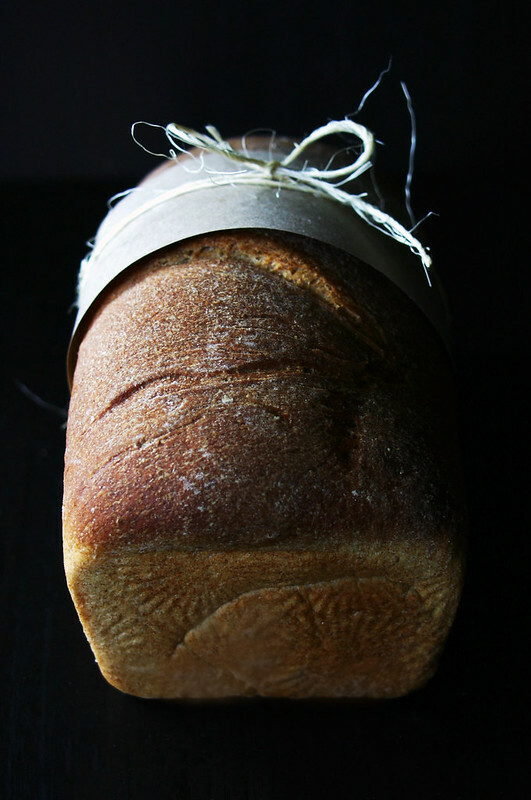 The rhythm of bread is circadian, cycling with us through our days for thousands of years. I’m grateful for bread, for rain, for rest, and for having someone I love to break it with. He loves bread as much as I do, never complaining about a meal consisting entirely of it in some form or another. He pats me on the head for bread well done. There is no higher praise. 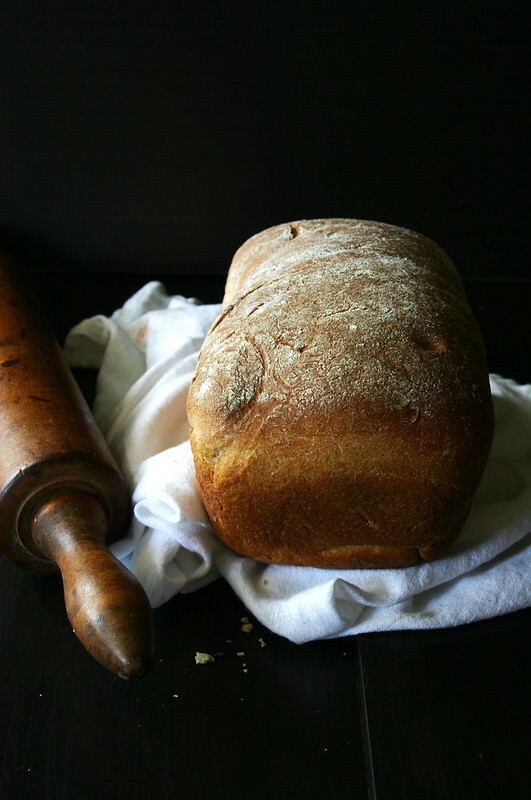 Warm, home baked bread is what slow food is about. It’s about reclaiming the spiritual and psychological territory that the unchecked commodification of food invaded. It’s rather radical in its temperate way, a taking back of something we sometimes lose sight of. 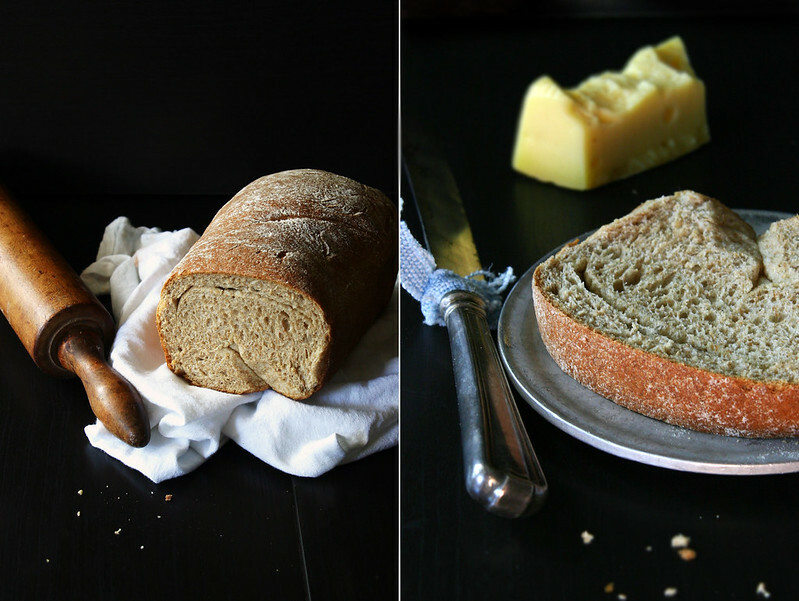 So here I share with you one of my favorite every day loaves of bread, Julia Child’s honey wheat. 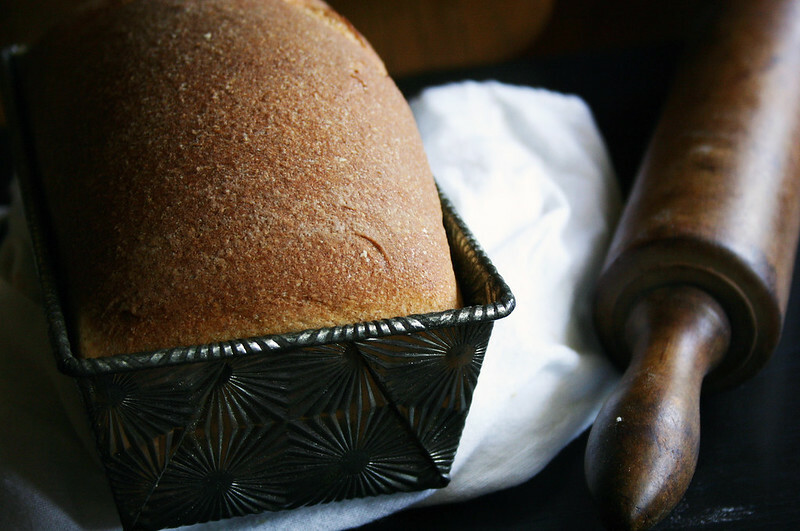 This recipe has just enough honey to bring out the natural nutty sweetness of the wheat, and it’s easy enough for a novice baker yet yields a bread that will have you feeling like you needn’t ever buy it from the store again. If you mix this recipe up in the morning you can have fresh bread by lunch time. We usually eat one loaf fresh and freeze the other. 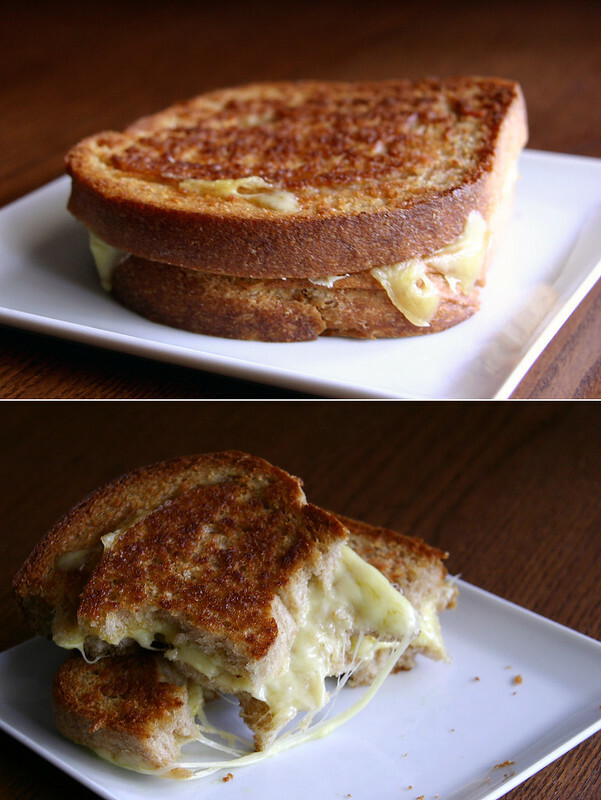 With some local cheese (I used Sequatchie Cove’s Coppinger) this makes an enviable grilled cheese. Just ask my jilted other half who did not get a grilled cheese because I cruelly made it in his absence. In the bowl of a standing mixer whisk to blend 1/2 cup of the water with the yeast and honey. Allow the mixture to rest until the yeast is creamy, about 5 minutes. Combine 3 1/2 cups of bread flour and all of the whole wheat flour in a bowl, set aside. Fit the mixer with the dough hook attachment. Add the remaining 1 3/4 cup water, oil, barley malt, and about half of the flour to the yeast, and mix on low speed, add the rest of the flour mix, and increase the speed to medium mixing until the dough comes together, stopping to scrape down the hook and bowl as needed. If it doesn’t come together add up to 2 Tbsp more white flour. Add the salt and continue to beat at medium speed for 10 minutes, until the dough is smooth and elastic. The dough will still be sticky. Turn the dough out onto a lightly floured work surface and shape into a ball. Place it in a large lightly oiled bowl. Rotate the dough to coat lightly in oil. Cover tightly with plastic wrap and let rest at rom temperature until doubled in bulk, about 1 1/2 hours. Oil or butter two 8 1/2 by 4 1/2 inch loaf pans. Deflate the dough by lightly punching it and turn it out onto a lightly floured surface. Divide in half. Roll each half into a 9″ by 12″ rectangle, with the short side facing you. Fold the top of the dough 2/3’s of the way down then fold again so that the top meets the bottom edge. Seal the seam by pinching. It takes me a bit of vigorous pinching to seal it. Turn each roll so that the seam is centered, facing up. Tuck the ends of the roll in just so that the loaf will fit in the pan. Pinch to seal these seams. 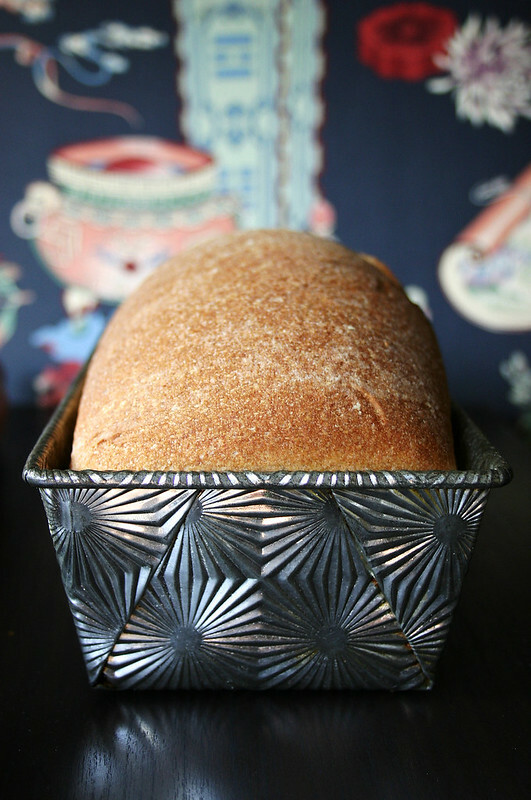 Turn the rolls over, plump and shape with your hands, and place seam side down in the loaf pans. Cover with oiled plastic wrap and allow to rise at room temperature until doubled in size again, about 1 hour. While they rise center a rack in the oven and heat to 375° F.
When risen (a finger should leave an impression when the dough is poked) bake for 35 minutes or until golden brown and an instant read thermometer inserted into the bottom of the loaf reads 200° F. Remove from pans and let cool on racks. Once cooled the bread can be wrapped and stored at room temperature or tightly wrapped in plastic and frozen for up to a month. To thaw let sit, still wrapped, at room temperature. I really enjoy your writing. Photography is gorgeous. But most of all, I want that rolling pin 🙂 Great post, thanks so much. I am so grateful for you comments and encouragement! And I love looking at your pins.. you have great taste in food photography! And I was so excited when I picked out this rolling pin for my birthday! I have a marble one but it’s sooo heavy and not good for delicate things. There’s a really cool antique mall here called the Knitting Mill and it is dangerously full of vintage kitchen stuff. I have to stay away unless it’s my birthday! It’s Barley Malt syrup. Malt extract also works. Beautiful post. I wanted to hug you when you spoke of your rabbit heart. Because I have developed a sensitivity to soy and soy lecithin I can no longer eat processed food. It has forced me to make slow food because everything in the grocery store has some form of soy. Because of my misfortune I have started making my own bread, which has turned into a blessing. These days I am eating very well. My only problem is in planning because I just can’t suddenly be hungry and depend on finding something I am able to eat. I have since learned to bake every week and freeze some for those days that I can’t get to the stove/oven. This is so beautiful I have to try it. I love the kneading by hand. It helps my rabbit heart, only this rabbit loves naps. I know the frustration of cooking from scratch when you’re super hungry. That’s when scrambled eggs and biscuits happen at our house. Which is a lot. I’m entranced by the writing and the photos. Awesome post. I look forward to reading other posts now. I really ought to be baking my own bread, too. Especially since it will help me figure out the vintage recipes I’m testing out. PS: I really wanted to the lick the screen. The bread looked THAT good. Your pictures are straight from heaven… Feels very warm and comfy to look at these pictures.. Please, please, PLEASE share the recipe for fig, balsamic, honey, rosemary tart/pie … I can’t wait. Your blog is one of the most beautiful and creative ones I’ve seen. Keep inspiring us please. The photos are taken… it should be up in a few days! I swear it. i like the pic set against the dark background and the answer to the problem of how to have a bread ready so i can grill sandwiches at lunchtime. nice job. I cannot emphasize the mightiness of this bread for grilled sandwiches. Oh man. These photos are my favorite so far… I lived in Chattanooga in my youth and your narratives warm my heart. I’ve finally embraced the town of my youth I so desperately wanted to escape… and couldn’t be happier! Always happy to have fellow Chattanoogans (current or former!) reading along. It veyr much inspires my work, this place. I have never made my own bread before and am about to try it, but I must ask – what would happen if I left the barley malt syrup out? Would it change the flavor/texture significantly? It would change the taste a bit, but it would be fine. Totally. Go for it. I might even just put in extra honey if it were me. Naturally that would make a bit sweeter…but I wouldn’t mind. Lovely, lovely post. Beautiful writing, gorgeous photos, and one of my favorite recipes. Thank you for writing this. This is exactly what I needed to read in the moment, naps and bread and the lilt and sway of your words and story. Beautiful! You’re so inspiring. I’m sitting in my office, there’s a gray day outside, I’m in a bad mood because my experiments aren’t working. And all the sudden I find myself thinking about baking something. It doesn’t have to be bread, just something. I bet those tiny pies were incredibly delicious! Let’s see if I can whip up some tiny peach hand pies when I go peach picking. Hi Beth! I just saw your post about the hand-pies at the market, and they sounded incredible. I’m sorry I missed those! I’m in town right now, and my mom and I were thinking about coming to the market on Sunday—any chance you’ll be back this week? Hope you are doing well. Your blog is beautiful. Unfortunately my being the pie fairy (or pie zombie given how I was looking last weekend!) was a one time gig for Local Food Day! But there’s pie baking class on the 25th, and I’m just a few clicks away from sharing my balsamic, fig, & rosemary recipe! Glad you like the work & I hope you’re doing well! Uhh, this melted cheese… WOW, wonderful bread! Your posts are exceptional, Beth. Love the photography and words here. I’m not much for naps, either, but I did give into my droopy lids and took a nap yesterday evening. Such beautiful, descriptive writing and I love the photos! 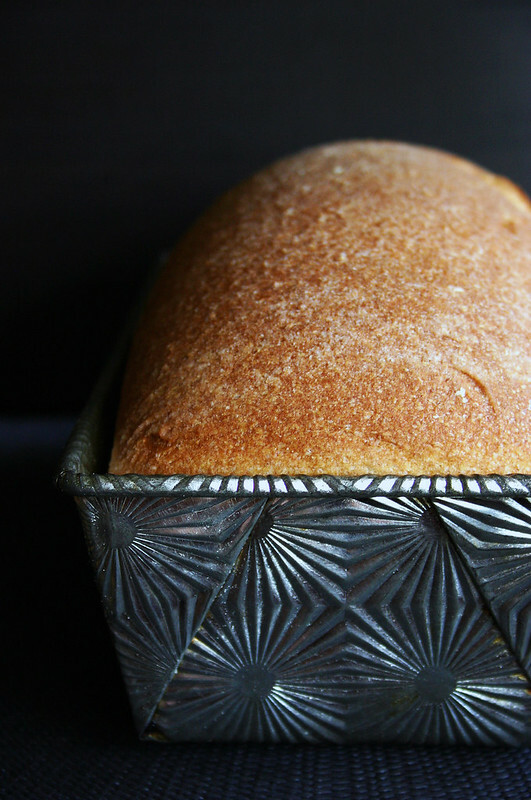 This bread looks just delicious and I can’t wait to make it! Where did you get your loaf pan? I love it. Wow..what a gorgeous loaf it is! And baked with whole wheat flour..baking it this weekend and pinning it right away. Please tell me where you got that gorgeous loaf pan! Love your blog. Found it via Pinterest search for Honey Whole Wheat Bread, but will be back to peruse more recipes. Love the photography and writing! I got it off of ebay. Just search for vintage starburst baking tins. My first bread attempt! I was nervous because I don’t have a mixer, but I figured people in the olden days probably made bread without that, right? I needed more water in order to mix it well with my hands, and I probably could have let it rise longer the second time. This will definitely be my go-to for sandwich bread in the future. Easier than I thought it would be and better than store bought. Thanks for the recipe, it was perfect. I”m so glad it worked for you! & I love that you did it by hand. I am in love with baking as well. Your description of baking really touched my soul. I have started my own sourdough starter that I use. You would LOVE it. I talk about it on my blog at http://www.amarmielife.com. You have to get Nancy Silverton’s La Brea Bakery book first though and read all about it! Awesome!! It’s my first time here and I’m falled in love with all: photos, words, style…gorgeous! Amazing. I’m going to try and make this on the weekend. There doesn’t seem to be too much rising and punching involved, so let’s hope this novice can make this! lol. Thanks for the recipe. Lovely photos! This turned out so well! I don’t have a mixer, and don’t think I will for quite some time. They run about a grand here in New Zealand (yeesh!) So elbow grease and abs of steel will have to do. In fact, my abdominal muscles are killing me today. I’m stoked to have a new workout every week. The bread is so worth it. Best recipe I have used. Ironically I am gluten-intolerant so I make this solely for my partner. Honestly, he raved about it and the recipe is that awesome that I am willing to torture myself once per week to make it. Try it. You won’t be disappointed. Thanks to the gorgeous Beth for sharing! Hello! Thank you for the recipe. Could you clarify the amount of water used? In the ingredient list it says 2 1/4 cups of water, but the written recipe only accounts for 1 3/4 cups. Your blog is new to me and your photography is simply stunning! I love how you use the food to be the highlight and center of your pictures rather than tons of lighting in the photographs. You know light. Thank you for sharing your exquisite pictures. Looks delicious.. Can someone clarify the amount of water needed. Is it 2 1/4 cups or 1 3/4 cups.. Thank you!!! website. I am hoping to check out the same high-grade blog posts by you in the future as well. Just happened upon your blog. Quite sweet and from your heart! I look forward to reading more. Thanks. Question – on the ingredients for your Honey Whole Wheat bread. You call for 1 Tablespoon of barley malt extract. Is that diastatic malt powder or non-diastatic malt powder?